Often, when I think of design, I think of it on far too small of a scale. I’m aware of the immense impact that design can have on the world, but it’s easy for me to get caught up in my own little computer and the small-scale projects that I work on. Articles like this one, Building a Design-driven Culture, bring me back to the reality of design being a multi-faceted, important, and widespread profession. It’s becoming more and more noticeable that customers prioritize the experience of buying and using a product over the performance of the product itself – something that a great deal of companies are beginning to take into account. For example, the company HP: through HP Instant Ink, they have shifted away from simple transactions (customers buying ink when they need it), and toward putting into place an ongoing service relationship. HP knows when it’s printers will run out of ink, and they preemptively ship more, which in turn saves customers time and effort. Making the lives of customers easier not only makes them more productive, but also generates loyalty and happiness. The authors of this article firmly believe that it’s not enough to simply sell a product or service – companies must truly engage with their customers. To do so, they outlined four elements of design-driven culture. First: The company must truly understand the customer. Design-driven companies seek to go beyond just what customers want, to truly uncovering why the want it. They’ll conduct one-on-one interviews, shopper-shadowing excercises, and customer decision journeys to understand what motivates them, what bothers them, and where there are opportunities for creating excellent experiences. A great example given for this was Sephora: marketing leaders at this company were observing millennials shopping on their site, and they noticed that before buying, the customers would go to YouTube to look for videos of other people using the product. This prompted Sephora to create its own videos to fill this apparent need. This part goes back to the human-centered design we’ve been talking about for a few weeks now. Knowing the customer – on a deep level – is so important for both simple human happiness and customer loyalty. It also ensures that the company, its products, and its customer experiences are going to be as close as possible to what the customer needs and wants. Second: Bringing empathy to the organization. An extremely important part of running a design-driven company is being certain that the people with the correct skill sets are in the right places. Which, to the authors of the article, means beginning with ensuring a chief design lead has a seat at the table where strategic decisions are made. They must bring the customer’s point of view to business decisions, translate business goals into customer-friendly initiatives, and build a culture in which employees think about how what they do affects customers. A designer must be a core part of any product or service development so that they can push this design-driven process for individual customer experiences. Third: Designing in real time. Developing a customer journey requires input from many places, and the authors of this article believe in an approach that combines design, business strategy, and technology as the core decision makers. By working together, these groups can directly understand the value that design can deliver, and make sure that customer experience is at the forefront of their minds. I loved this part, because I think it’s so important for people in other professions to appreciate the power of design. Many people barely even know what it is, outside of making things look pretty, so involving a wide variety of people in the design process (and putting a designer in a place of authority), is a great way to start. Fourth: Acting quickly. Good design is fast, and it depends on rapid prototyping, frequent iteration, and adjustments based on real customer feedback. In a design-driven culture, companies aren’t afraid to release a product that’s not completely perfect – meaning that the product goes to market, the company learns from customer feedback, incorporates it, and the releases the next version. Instagram, for example, was launched by releasing a product, learning which features were most popular, and then relaunching a stripped down version. This section was what surprised me the most. I’m a perfectionist, and since most of my projects have been fairly small scale, I have had the opportunity to continue nitpicking until I’m happy with the final result. However, while reading this article, I realized that in the future (and even now, somewhat), that might not be the best way to approach things. For a school assignment, it’s okay, but once I get out into the “real world” I can’t spend as much time on a single project as I have been able to during my studies. I have a dangerous mindset, at times, that once something is “done” (once I’m happy with it), it’s done and it doesn’t get touched again. However, what space does that give me for feedback and improvement? Not much. Something to work on. 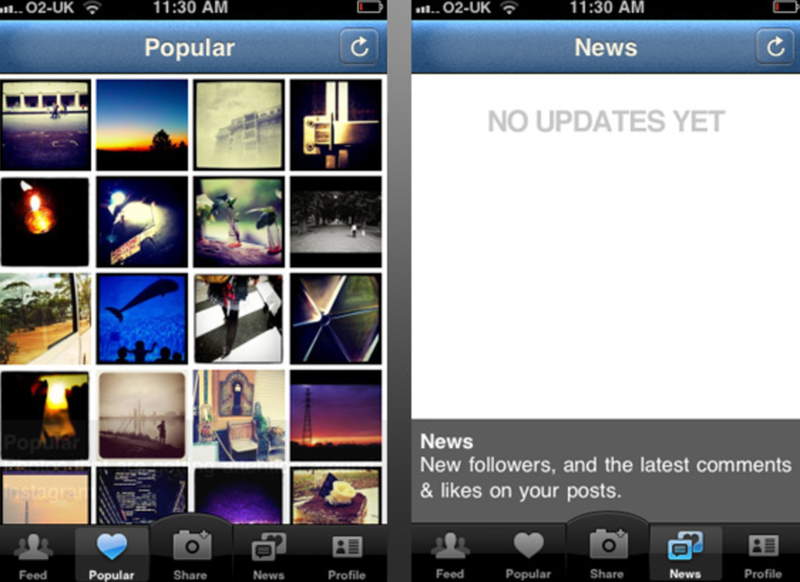 The first version of Instagram, with options like a "News Feed." Today's Instagram: streamlined and catered to customer wants and needs. Reading articles like this one remind me that design, what I want to do for the rest of my life, is impactful. It makes the world not only a more beautiful place, but also a better place, with happy people and wonderful experiences. Killian, Jennifer, Hugo Sarrazin, and Hyo Yeon. Building a Design-driven Culture. McKinsey & Company, Sept. 2015. Web. 21 Apr. 2017. Reading through this section of Visual Research: An Introduction to Research Methodologies in Graphic Design made me question (or, at least, take a good hard look at) my approach to my capstone project. My project is extremely human-centered: I’m gathering the written or verbally communicated words of others, on the extremely personal and emotional topic of loss. The goal of my project is to create a book, one that can benefit both those who contributed to it and those who read it. Because I’ve experienced a great loss of my own, I moved forward with this project based almost solely on feeling. I felt a need in the world – a need for an honest, open, and raw publication on all facets of loss – and I felt like I could begin to fill it. All of the books on loss I’d been given or paged through seem to be so one-size-fits-all, glossing over reality, and written towards one specific audience. I immediately began putting myself out there, asking people to contribute their stories, sharing requests for help with complete strangers – all because I felt so strongly about what I was doing. And, that’s good – I’m excited about this project, and I do think it will be a beautiful thing. However, what this reading made me realize, is that I need to take a step back and get a little more critical. While I do think that this reading was lacking in the passion, purpose, and feeling that drives design, I also believe it did a good job of outlining the systems of research in place. I can have all the feelings in the world, but without adequate research methods and defined objectives, my project won’t be as effective as it could possibly be. The writers broke a design brief down into three pieces: field of study (where the work will be situated, and what function it will fulfill), project focus (what the specific context and function of the work will be within the wider field of study already defined), and research methodology (how the designer will go about researching and developing the project in response to the context and intention outlined above). For the rest of this post, I’ll take a look at how I can implement these processes into my own work this quarter. Field of study defines the broad context for the work, and the first task facing the designer is to research their field of study, to acquire knowledge of what already exists in that area, and the visual languages which can be directly associated with the target audience or market for the design. So, as I mentioned above, I’ve read a few books on loss. I’ve perused through bookstores, read online reviews, and they’ve been thrown at me by well-meaning individuals. However, I know that I haven’t done as in-depth of research as I should – are there books out there like the one I want to create? Are there ones that are similar? If so, what do they look like? How are they approaching the same problem I’m approaching? How can my project be different, and what can I learn from theirs? I know my audience – those who have experienced loss, and those who are close to someone who has experienced it – however, I need to get a better handle on what already exists out there for them. What I've found thus far (dated, beautiful-sounding, one-size-fits-all, self-help-esque books). Not that these don't help certain individuals, but a great deal of people I've spoken with are disillusioned with them. I hope to create something much more meaningful/honest/raw. The second portion of the design brief, the project focus, marks the exact intentions of the work to be undertaken. Since I have such a personal experience with loss, I feel as though I’m well versed on the subject – however, because I want my book to be aimed at everyone who has experienced any kind of loss, I need to make sure the book speaks to them. Not just me. Everyone’s experience of loss is different, and if that’s what I want to highlight, I need to make sure my approach is something most people who’ve experienced loss can relate to. I’ve spoken with a great deal of people, all who are contributing to the book, however I’ve never actually asked them what they would want out of this project. I’ve asked them to write about or speak with me on their experience of loss, but I’ve been so caught up in my own idea, that I never took the time to also ask them their thoughts and opinions on the project’s direction. Doing this could lead to slight redefinitions in the project focus. And finally, the research methodology, a set of self-imposed rules by which the designer will engage with a project. I think that this is a part I’ve done well, thus far. I’ve been communicating with the contributors to the book for a few weeks now, and I’ve streamlined the process – telling them what they need to know, a rough outline of what they should tell me, answering any questions they might have, etc. The result has been a beautifully diverse yet semi-cohesive collection of words, to be put in the book. I haven’t begun the visual design process of my project yet, so I think that mapping out, developing, and testing my visual solutions will be an important next step. Noble, Ian, and Russell Bestley. Visual Research: An Introduction to Research Methodologies in Graphic Design. Lausanne: AVA, 2005. Print. Human centered design, an approach to problem solving that starts with people and ends with solutions to meet their needs, is a process that consists of three phases: inspiration, ideation, and implementation. During the inspiration phase, the designers will simply learn about and learn from their audience – opening themselves up to creative possibilities, and trusting that as long as they remain true to the wants and needs of the people they’re designing for, their ideas will evolve into the correct solution. During the ideation phase, the designers (and their stakeholders) will come up with ideas – lots of them. The bad ideas will be tossed, the good ideas will be refined over and over again. The ideas will continue to be tested, prototypes will be made with countless iterations, and feedback will be integrated. After the final idea is solidified, partnerships will be made, business meetings will occur, the idea will be advertised, and the world will hopefully be changed for the better because of it. Emi Kolawole, Editor-in-residence at the Stanford University d.school, believes that empathy is one of the most important parts of human centered design. Empathy lies at the heart of human centered design, she says, because people are at the heart of human centered design: it’s all about understanding. In order to have true human centered design, you have to understand the people you’re designing for, you have to understand their needs. We can’t come up with any new ideas if all we do is exist in our own lives. In order to get to new solutions, we have to get to know new people, we have to travel, we have to immerse, we have to do something different. When attempting human centered design, Kolawole says, if you’re not surprised – you’re doing it wrong. The most important part of the inspiration phase of human centered design is the interviewing process. IDEO’s Design Kit outlines a few key steps to unlocking insights and understanding that designers could never get simply researching behind a desk. First, interviews should be conducted – if possible – in the interviewee’s space. You can learn much more about a person and their lifestyle by talking with them where they live or work. Second, no more than three research team members should attend a single interview so as not to overwhelm the participant. Each member should have a clear role. Third, the researcher(s) should come prepared with a set of questions they’d like to ask. When hearing their answers, it’s important to write down exactly what they’re saying, not what you think they might mean. The process is all about hearing exactly what people are saying. Lastly, what the person says is only one data point. It’s important to observe the interviewee’s body language as well. The goal of an interview is to really understand the experiences, needs, and desires of the person you’re designing for. During the ideation phase, soliciting feedback on your ideas and prototypes is one of the most important parts of the process. Once you’ve done a ton of research, performed countless interviews, gotten great feedback, have an idea you’re excited about, and you’ve begun working on it and prototyping it, it’s easy to think you’ve almost made it. However, you aren’t – post-initial prototype feedback is necessary, because if the point of a prototype is to test an idea, collecting feedback from potential users is what pushes things forward. Honest feedback is crucial, and a variety of feedback from diverse users is important for pushing ideas further and making sure your design speaks to each person you’re designing for. During the implementation phase, you’re still not done tweaking. Even though your solution is ready to get out there into the world – or if it’s already out there – iterations can and should still be made. How could your solution be even better? Keep gathering feedback, continuing to iterate, and building what you’ve learned back into your solution, and the impact will grow. An example of a great human centered design process is Vroom – a large scale messaging campaign celebrating everyday moments as learning opportunities, the fundamental message being that taking advantage of the many chances to engage with a child strengthens the foundation of that child’s brain development. The IDEO team began with an immersive inspiration phase, visiting low-income communities in a wide variety of cities to conduct interviews with parents and observe existing programs aimed at improving child development outcomes. The team found that, in multiple ways, many of the parents did not feel equipped to engage with their children. After the research was complete, the team synthesized its findings and looked for patterns among the interviews. As they put together what they had learned, they formulated a set of design principles for the campaign. They came up with a series of personas, each representing a woman from the communities being served, and invited mothers to the office to review mood boards, listen to sample voices, and provide feedback on which character they would trust for advice. From this, the team realized that most parents were extremely interested in the science behind brain and behavioral development. By the end of the first two phases, the team had created a strong brief that could be handed to an advertising agency and used as the foundation for a major campaign. They came up with prompts for people to play with their kids, and an ad strategy that included interventions displayed in laundromats instead of on big billboards. After a few years, the Bezos Family Foundation launched the pilot of Vroom. What Is Human Centered Design? Dir. IDEO. Design Kit. IDEO, n.d. Web. 17 Apr. 2017. Empathy. Dir. IDEO. Perf. Emi Kolawole. Design Kit. IDEO, n.d. Web. 17 Apr. 2017. Optimism. Dir. IDEO. Perf. John Bielenberg. Design Kit. IDEO, n.d. Web. 17 Apr. 2017. "Methods." Design Kit. IDEO, n.d. Web. 17 Apr. 2017. "Case Studies." Design Kit. IDEO, n.d. Web. 17 Apr. 2017. Because disposable plastic goods waste resources, have negative environmental impacts, and cause health risks, I certainly believe that MSLK’s concern was relevant for social good. Through the case study I read that each second, 1,500 bottles of water are consumed in America. And each year, 80 percent of the consumed water bottles end up in a landfill – even though recycling programs have drastically increased. I also learned that approximately 17 million barrels of oil are used in the production of bottled water each year. I do think that design systems thinking played a role in the development and execution of this project, because its creators put a lot of thought into how the exhibition could reach the greatest number of people. The way that they formatted the chains allowed for installation in a wide variety of environments, from natural settings to industrial. They also took into consideration that, while the imagery of the water bottles does speak for itself, people who don’t know anything about the consequences of bottled water might need a little more context. So, they integrated informational signage that outlined facts on the bottled water industry and its effects, as well as how drinking tap water and using a reusable bottle can be better for both humans and the earth. Watershed is extremely human centered, because it not only tells humans how they can help themselves, but also how they can help the environment and the entire planet. And because it’s a somewhat interactive installation – the water bottles can be touched – it’s accessible for those who may be visually impaired. What I appreciate about Watershed is its unashamed simplicity. It represents exactly what it’s trying to represent: the unnecessary and extreme consumption of plastic water bottles. The designers used only what was vital to getting their point across. I think it’s important that the water bottles they used were reclaimed, because the use of sustainable design in this way speaks into the point MSLK is trying to get across. I also appreciate that the scale of this installation is so large – when walking past it, you cannot help but stop and look. Because you’ll immediately see over a thousand plastic water bottles, you’ll at least be intrigued, but if you’re carrying a plastic water bottle with you? You’ll be compelled to think about your actions. The second case study I looked at was titled, “Make Congress Work!” (Found here: http://www.aiga.org/justified-2012--case-study--make-congress-work). The final artifact was a booklet, designed by Maloney & Fox for No Labels, a non-profit, bipartisan group of Republicans, Democrats, and independents. No Labels has a simple underlying goal: for the government to work again. Because they believe the biggest problem with Congress is the outdated rules, they commissioned the booklet to outline their 12 steps on how to fix communication in Congress. The intended audience for the booklet was not only those in working in the government sector, but also the general public. Maloney & Fox most definitely used design systems thinking during the creation of this booklet, and it’s obvious simply by giving it one glance. Most books and documents regarding the government are text heavy and unfortunately boring in appearance, or go overboard on “red, white, and blue” branding. However, this booklet has large typography, stand-out quotes from well known figures (that pertain to communication, not just politics), red, orange, green, and blue color blocks, and an unusual size. Maloney & Fox wanted the booklet to be both noticeable when on the congressmen’s folders and desks, and appealing to the general public. The unique design of the booklet not only makes it noticeable and appealing, but it also promotes conversation between the political parties, which No Labels believes to be the best outcome for all people. Because the book is not overly red, overly blue, or boring in its appearance, it’s a welcome change for everyone. “Make Congress Work!” is a very human centered design, not only because it focuses on informing both the government and the general public about communication changes that should be made within congress, but also because it seeks to better our country through this improved communication. I don’t necessarily think the general format of this design is groundbreaking, because booklets are nothing new and nothing necessarily unique, however I do believe that it appropriately responds to the design challenge presented. It has the unique appeal that I outlined above, and it’s also easily accessible – anyone can get a copy for themselves. And because it received such great media attention, the production run was increased from 2,000 to 25,000. MSLK. “Case Study: Watershed.” AIGA Design for Good. AIGA, 10 Nov. 2011. Web. 3 Apr. 2017. Maloney & Fox. “Case Study: Make Congress Work!” AIGA Design For Good. AIGA, 4 Oct. 2012. Web. 3 Apr. 2017. Design thinking is described as a systematic approach to problem solving that has its roots in business and starts from considering the needs of the clients or customers. Most challenges faced by individuals or groups of people require solutions that are grounded in the specific needs of these individuals or groups, so it’s unfortunate that many designers focus all of their attention on improving the look and functionality of a product. Design thinking also addresses the product or service appearance and structure, but first carefully addresses the needs of the people who will consume them. It is an extremely is a human-focused process, relying on the design team to construct ideas with emotional meaning as well as functionality. Instead of CEOs and behind-closed-doors conglomerates making big decisions on behalf of people they don’t know, businesses are beginning to use design thinking by working closely with the clients and consumers for more effective and innovative solutions. According to IDEO, design thinking is best thought of as a system of overlapping spaces rather than a sequence of orderly steps. These spaces are inspiration, ideation, and implementation. Inspiration can be thought of as the problem or opportunity that motivates the search for solutions, ideation as the process of generating, developing, and testing ideas, and implementation as the path that leads from the production into people’s lives. During the inspiration space, the brief is created. The brief gives the project team a framework from which to start, marks to measure progress, and objectives to be sought after (What are we trying to do? Who are we trying to do it for?). Then, the design team seeks to discover what their target audience’s needs are. And this is where many teams falter – they use focus groups or surveys, which only ask people what they want. They don’t lead to innovation. Instead, proponents of design thinking suggest designers go out into the world and observe the actual lives and experiences of stakeholders. Working with cultural guides, being immersed in a community, shadowing locals, and utilizing homestays are great ways to build credibility and understanding within a specific group of people. During the implementation space, the best ideas that were discussed during ideation are formed into a fully thought out action plan. Prototypes are made, tested, and refined. Through prototyping, the design thinking process can catch unforeseen challenges and consequences for the sake of reliable and long-term success. This part of the process is especially important when creating products and services for lesser developed areas, because the lack of systems in place make it harder to design new and innovative products and services. After prototyping is finished, the design team creates a communication strategy. Storytelling through multimedia helps communicate their solution to a diverse set of stakeholders. Airbnb, a well-known company that allows people to both host and be hosted in their own homes, was on the verge of failing in 2009. Revenue dropped to only $200 per week, and the three founders decided to do some research to find out the problem. The overarching issue? They hadn’t been using design thinking. They realized that one of the major issues was the lack of quality images for the listings posted on their site. So, they decided to do something about it – they rented a camera, visited hundreds of listings, and replaced the poor images with high quality ones. After doing this, they understood that their business model was not human centered. And since what they were trying to do – match real people with real homes – is incredibly human centered, this was a problem. Now, they focus on putting themselves in the shoes of an Airbnb customer. Each new employee will begin their job with a two week trip, staying in multiple Airbnb listed homes. This way, they can understand the struggles of customers, and figure out how to improve their company based on customer wants and needs. After using design thinking and making a decision to focus on the humanity that truly runs their company, Airbnb took off. For my project in this course, I am going to be focusing on the experience one has in an airport. I’m not entirely sure of the direction I will be going, but I know that I want to increase the feeling of humanity in either an airport or airplane, because of the emotional experiences I have in and through them. Each and every person travels through an airport and sits on a plane for completely different reasons – some exciting, some devastating, some in-between. I believe that most people, including myself up until this past year, are extremely individualistic when it comes to airports. We’re so focused on getting from point A to point B as quickly and as easily as possible that we forget about the other passengers. The man that was just pushed to the side by a woman in a hurry to get through security? His mother just passed away, and he’s on the way to her funeral. The child who won’t stop crying? He’s extremely ill, and there’s nothing his parents can do about it. Airports and airplanes are often emotional places, and I want to make each person’s experience a more positive and simply human one. Because everyone has such different reasons for travelling, I hope to make something that can apply to a wide variety of people and experiences. And because this will be incredibly human-centered project, I will need to use design thinking to make the process incredibly human-centered as well. I will have to observe people in airports, looking at what they do, where they go, how they look, and how they act, even asking questions about why they’re travelling. I will have to draw upon my own experiences in airports, and ask a wide variety of people about their own. Possibly, asking flight crew and TSA members about their experiences with the passengers and travelers. Pankaj. “How Design Thinking Transforms the World and Lives of Millions. Ikoniq. N.p., 3 Jan. 2017. Web. 30 Mar. 2017. Mugadza, Grace. “Systems Thinking and Design Thinking: Complimentary Approaches?” Systems Thinking World Journal. N.p., 9 Feb. 2015. Web. 30 Mar. 2017. Brown, Tim, and Jocelyn Watt. "Design Thinking for Social Innovation." Stanford Social Innovation Review. Stanford Graduate School of Business, Winter 2010. Web. 30 Mar. 2017. This infographic is by Ben Willer, titled “The Love of Guns.” It represents the civilian firearms per 100 people, and the homicide rate per 100 people. During his research, Ben noticed that the United States has an extremely high rate of firearm ownership, however the homicide rates in the US are far lower than a multitude of poorer countries. Places such as Latin America and Africa have some of the highest rates of homicide, even though they are on the lower end of the gun ownership scale. Therefore, the question Ben is posing with this infographic is: Do guns make for a safer or more perilous world? He doesn’t seek to answer the question, but rather to incite curiosity and thought within the viewer. This infographic is absolutely stunning. It’s unlike anything I’ve ever seen, and almost looks like a piece of art that should be hung rather than an infographic about guns (Although, I suppose it could be both). It’s extremely complex in its visuals – yet not overwhelmingly so – and its radial nature and thin line weights give it an airy and ethereal appearance. I love how everything has a circular or radial form, until the very center where we find this amazing network of webbing. The light colors pop against the dark background, the typefaces choices are excellent, the long length of the infographic is unique…Visually, I love it all. However, apart from the visuals, I’m struggling to find much else to love. I wanted to love everything about this infographic, I really did. However, I cannot for the life of me figure it out, and I can’t help but wonder if I’m missing some sort of key or vital information. I can easily understand that Honduras has the highest something – but what? Does it have the highest rate of civilian firearms per 100 people, or the highest homicide rate per 100,000 people? Maybe I’m missing something, but I don’t think there’s any information on the infographic that would help me distinguish this. I’ve figured out that each color represents a region (Africa, Asia, Oceania, Europe, and the Americas), however I don’t understand what the dots along the semi-circles are telling me. I can decipher that, for example, Poland is in Eastern Europe – but the position of its dot doesn’t hold any sort of meaning. Is it telling me something about guns, or homicide? There are no numbers nor any sort of key cluing me in. I’m frustrated with this infographic, because of how amazing I think its appearance is and because of how confusing I think its narrative is. I want so badly for it to be understandable, and for it to tell me a story, but it simply doesn’t – and unfortunately, that’s not a sign of a good infographic. Infographics should be easily understandable, telling the viewer information in an accessible manner. I could read up on firearm ownership and homicide rates quicker than I could decipher this image. Willer, Ben. The Love of Guns. Ben Willer, 2013. Web. 14 Feb. 2017. I wanted to focus on this infographic in particular because it was the one that initially drew me in – I’m pretty sure it was the gorgeous pops of color, but I’m also a sucker for thin line weights and mixed typeface choices. The icons are absolutely beautiful, and even though they vary in line weights and fills, their colors, sizes, and styles make them semi-consistent (for example, the “ok” versus the “yes” versus the “no” – they’re all different, but you can tell that they belong within the same infographic because of their consistent size, color, and typeface. Same goes for the hedgehog versus the walking man). However, this starts to become a problem, because I could say the same for almost every design choice that was made in this infographic: The line weights are different throughout (dashed, thin, extra thin), but you can tell that each line belongs in this infographic because of its color/orientation. The typefaces are different throughout, but you can tell that each block of text belongs in this infographic because of its color/size/etc. And so on, and so forth – can you begin to see the problematic pattern? Yes, this infographic is beautiful, and yes, it all fits together in a visually pleasing way, but the slight inconsistencies create a big issue for the overall understanding. The first issue is that there is no color codification. The red, blue, and black look nice together and create a nice balance throughout – however, there seems to be no rhyme or reason for when and where each color was used. Red doesn’t mean any certain thing, nor do blue or black. This makes navigating through the infographic much harder, because seeing red, blue, or black doesn’t automatically clue me in to anything specific about what I’m seeing or reading. The second issue is that there doesn’t seem to be any pattern to the typeface choices, and while this might look nice, it also creates a barrier to easily navigating the infographic. The script font is used in a headline, in an icon, in a title, and in a question (as are all of the other fonts) – so I can’t associate a specific typeface with any specific type of information, which for such a complex infographic is quite a hindrance. The last issue is that the line weights and colors are also too inconsistent. Again, they look great, but there’s no meaning behind whether the line is thick, thin, dashed, red, black, or blue. It would be helpful to have each type of line leading to a specific kind of information. Overall, I think that this infographic accomplished its purpose. Its design could be improved; however, it certainly gets across the point that “shooting a film isn’t that simple.” It accurately shows the complexity of creating an animated film, and does so with a unique humor that makes me excited about navigating through its entirety. BETC Paris. “I Want to Make an Animated Film.” Visual Storytelling. N.p. : Gestalten, 2011. 213. Print. 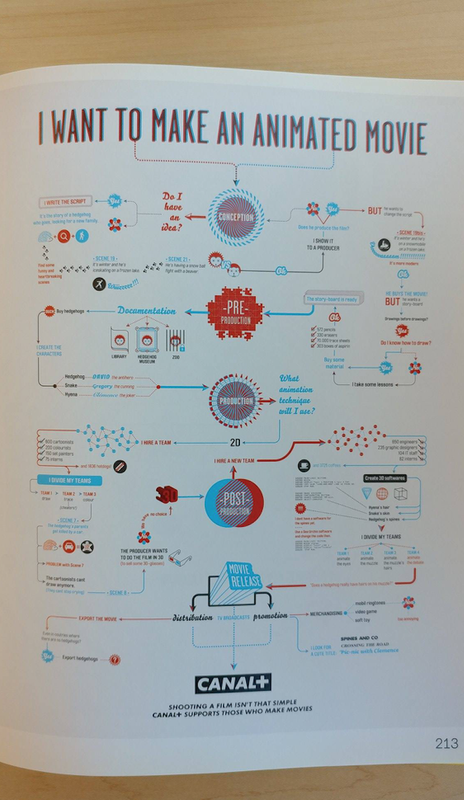 This infographic was made by Ben Willer, as part of his MA Design Major Project at the University of Lincoln. I was initially drawn to it because of its incredible controlled chaos. The graphic is anything but simple (in fact, it’s quite complex), yet somehow upon first glance the overall infographic appears neat, clean, and light – having the busy, colorful graphic balanced with the thin and airy type on the right lends to this. The graphic on the left is a visualization of Ben’s life, comparing time-sensitive events (where he lived, what his interests were, what kind of sports he played, what model of car he drove, and where he studied) and eventually, the number of hours worked at his job, to his mood. It’s an amazing concept that Ben has come up with – representing his entire life in one data graphic – and in my opinion, he executed it beautifully. It’s a complex graphic, but one that’s easily understandable if you spend a few minutes decoding it. First, let’s talk about the mood meter. It goes from yellow (a color that immediately evokes a happy feeling) to blue (a notoriously “sad” color), with mixes in between to represent less extreme feelings; an example of his excellent color codification: Ben doesn’t shy away from using a lot of colors, and he manages to use each color effectively. The placement of the mood meter is perfect because its wraps around all of the life events, representing the concept that his mood doesn’t have an end – in contrast, the life events (such as where he lived and what his interests were) have a start and an end. As the circumstances in his life change, his mood changes in response to them, but he never stops feeling. Secondly, the layout of his life events. Thanks to the color codification, it’s easy to understand what’s happening – we don’t just see a bar that says “video games,” we see a red bar and immediately know that video games was an interest of his from mid-1991 until the present. We can understand that Mansfield wasn’t the name of his dog, but rather a place that he lived for the first few years of his life. The circular layout of the specific life events, as well as the graphic as a whole, was an excellent design choice: it’s perfect for representing the continuation of a life, and the thin leading lines going from the center to the outside of the circle draw our eyes out to what’s going on each year. Third, the red lines shooting out from the circle that represent the average hours worked per week at Tesco in a month-long period. Light work is represented by a light red shade, and heavier work as a darker one. Another example of great color codification! This is when I began to notice how his life patterns were affecting his mood. The more he worked, the more depressed he became. When he decided to go back to school for his MA and spent less time at Tesco, his mood drastically improved. I also love the text on the right that gives viewers more in-depth information if they so desire it – its simplicity balances the complex graphic on the left, and its rag subtly emulates the pattern of the red “hours worked” bars. Overall, I absolutely loved how Ben chose to represent his life. His ability to visually represent how life’s many different aspects interact and affect each other is beautiful and intelligent. Willer, Ben. Life in Data. Ben Willer, 2011. Web. 8 Feb. 2017. Settlers of Catan is a game that’s regularly played in my apartment, and I’ve never taken the time to look at the instructional and information pamphlet that comes with it. As I was thumbing through the booklet searching for infographics, I came across this one that covers the Settlers of Catan “Board Game Family,” outlining the different versions and expansions available for players. First of all, I’m not sure that the information covered warrants this infographic style layout. In my opinion, laying out the different versions and expansions in a list format – or even in a similar stacked format without the arrows and numbers – would be just as effective. The arrows and numbers, which are typically additions meant to guide, actually make me more confused. Why are there four different #2’s? Why is one of them yellow when the other three are white? Why is the #1 also white? Why are there three different #3’s? The usage of yellow and white seems to have no real meaning, and the multiple copies of each number don’t help guide my eyes through the infographic – instead, I don’t know what to focus on or where to look next. The fact that some of the lines are dotted, some aren’t, some are vertical, and some are horizontal also lends to the general confusion. Should I be going top to bottom, or left to right? Or both? Once again, there seems to be no reason behind the multiples styles and directions. Compared to Ben Willard’s “Life in Data” project that I previously discussed, this infographic is extremely simple. And yet, due to its lack of color codification and meaningful graphics, it’s far more confusing. The only thing that helps me better understand this infographic is the text. I can understand by reading the headlines that we’re going from the overarching game, down to the expansions, and finally down to the extensions (although, I’m still confused about why the extension with the yellow #2 has been placed higher than all the other extensions). This is why I believe this information would be better understood in a simple list or stacked format. The point of an infographic is to concisely and effectively point out important information in a visual style – not to make viewers read paragraphs of text. Overall, this is not a very visually pleasing or understandable infographic. Even though they may seem inconsequential, materials like this matter when it comes to the overall experience of a game. They shouldn’t be thrown to the wayside! Settlers of Catan. Board Game Instructions and Information. Designer Unknown. Web. 8 Feb. 2017. Infographic on the daily routines of creative people. The first great thing about this infographic is that it easily guides your eyes through the steps that are necessary to understand its narrative. Starting at the top, you immediately know that the infographic is going to be outlining the daily routines of famous creative people. Then, as your eyes make their way down the page, you get a more in-depth description (along with a cited source) of what you’ll be discovering – paired with instructions on how to make it interactive. Next, you find your way to the key, which succinctly tells you what each color means. After glancing at the timeline to understand at what time the daily routines are beginning, we can finally take a look at the most important part: the routines! This infographic also has excellent color codification. For each person, as we can tell by looking at the key, the colors mean exactly the same thing. When we are looking at a specific person’s routine, it’s always extremely understandable what they were doing at a given time due to the consistent color meanings. And what’s even better is that this infographic is interactive: We don’t have to simply see that they were exercising and leave it at that – instead, we can hover over their “exercise” segment and read that they were taking a walk through the streets of London. I appreciate that the designer kept the layout simple, and only gave more superfluous information if it was wanted by the viewer. For example, if I’m only interested in the daily routine of Picasso, I can hover over his daily routine singularly, instead of having to scroll through lengthy descriptions of the other creative’s routines. I also appreciate that the designer added a small information button next to each individual, in case after seeing their routine you’re curious about who they were. Close up of hovering over a segment. My first negative critique of this infographic is its linear layout. While I appreciate how that makes the infographic appear visually, and how the hours can be easily understood, I don’t necessarily think that it’s the best layout for understanding the information. The infographic’s timeline begins at 12 a.m. and ends at 12 a.m., yet because it is a straight line this doesn’t make much sense. It is the designer’s intention that, for any given creative, we start at 12 a.m., make it to the end of the bar at 12 a.m., and imagine the routine is starting over again for a new day. However, in my opinion, having a linear timeline means that there is a definitive start and finish, a beginning and an end. Because these are daily and repetitive routines, I think that a circular timeline for each person would be a better graphic format. It would reinforce the idea that these routines are not a “one-and-done” thing, rather they are continual. The second and last negative critique I have for this infographic is its lack of hierarchy. I love thin line weights when it comes to type, however I think the designer may have slightly overdone it. From the top, all of the type is in the same thin line weight, until we get to the names of the creatives. Having each name in bold is great, especially against the colored bars, however I think the infographic needs just a bit more. Having either the times in bold or the key in bold would be helpful for calling out the important information. Overall, I really loved both the subject matter and the layout of this infographic. I learned more, I was inspired, and because of the cited sources at the bottom I knew I was getting accurate (or as accurate as possible) information. What a great concept! Citrix. 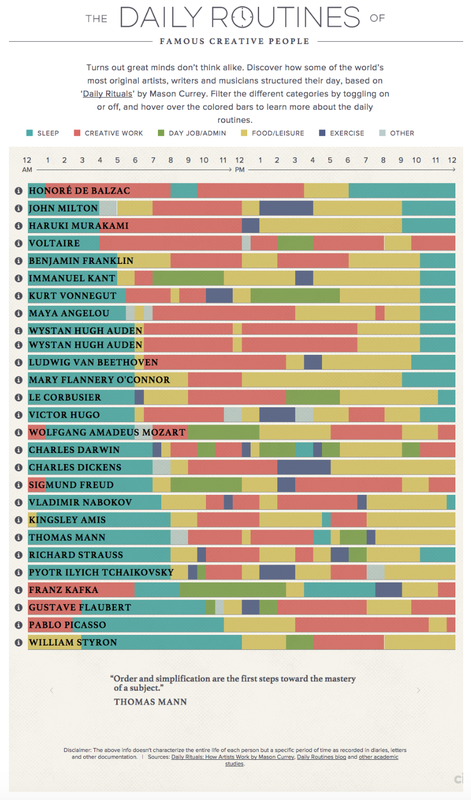 “The Daily Routines of Famous Creative People.” Podio. Citrix Podio, n.d. Web. 03 Feb. 2017. Infographic on 38,000,00 deaths and 25 conflicts from 1915 to present. Upon first glance, this infographic I found in the book Visual Storytelling appears to be about cooking, or maybe making homemade jam. I read the title: 100 Years of World Cuisine, and observed jars, red liquids, and kitchen utensils. But then, I got a little closer – took a longer look – and realized that this information graphic was most definitely not about cooking. I noticed that under the title were the words: 38,000,000 deaths, 25 conflicts, 1915-present. I understood that the “red liquid” was not so much jam as it was blood. I took in the callouts that read things like “Armenian genocide, 1915-1916, 1,500,00.” And all I had to say for a while was, wow. This infographic is powerful, to say the least. The fact that they chose to represent the amount of deaths in each conflict by the amount of blood in a jar, cup, or kitchen utensil rather than an illustrated bar graph or chart brought shocking realism to the information presented. If I were to see these numbers in some sort of graph or chart, I would be surprised and saddened, however seeing a giant jug filled with blood that represents 6,000,000 people dying in the wars in Indochina brings a whole new level of meaning and significance to these numbers. It makes me think endlessly of the people that died, it makes me uncomfortable to see blood representing their deaths in such a nonchalant and everyday setting, it makes me hurt – so much more than any “typical” infographic could. That being said, I do think it is helpful to have the three charts in the upper right hand corner: Breakdown by continent, breakdown by decade, and total 20th century death toll. After being so shocked, they help bring you back to reality. Because of how painfully impactful this infographic is, I honestly can’t say I have many negative critiques. Could some of the design be better? Yes. The charts in the upper right hand corner are extremely hard to see, the type layout could use improvement, and the type system lacks hierarchy. However, the infographic did its job perfectly for me. I didn’t care about the type, and I didn’t care that it took me a little longer to understand the charts in the upper right hand corner. I was both informed and impacted by this infographic – more than almost any others I’ve seen – and that’s what is important. Andrew Lowsowsky. “Breaking News.” Visual Stories. N.p. : Gestalten, n.d. 72-73. Print. Everlane is an online apparel and accessories retailer, founded on the idea of “radical transparency.” They believe that their customers have the right to know what their products cost to make, and they reveal their production process, true costs, and markups along the way. However, the company understands that their customers don’t necessarily want to spend their free time reading long paragraphs of text about what they’re buying – online shopping exists because it’s quick and easy. Therefore, they create minimalistic yet effective infographics to get the pertinent information across to consumers. This infographic is about the production timeline for the classic Everlane backpack. While the design is simple, the narrative layout, iconography, and use of color codification packs quite a punch. First, the narrative layout: When customers look at this infographic, we know exactly what to do. We see the title first – “Production Timeline: The Everlane Backpack.” Immediately below is a giant “start” checkpoint, and from there on we know to continue down the page (to 4 weeks, 6 weeks, 7 weeks, 9 weeks, 15 weeks, to finish). The total production time, as we see at the bottom of the page, is 16 weeks. Since we don’t get to that information until the very end, the way that the designer made each circle a sort of countdown timer (from an fully black circle at the start to a fully red circle at the end) is extremely effective. While our eyes are still making our way down the timeline, we may not know that the total production time is 16 weeks. However, because the designer highlighted the amount of time it’s been since the start in red, and the amount of time left until the product is finished is kept black, we always have an idea of how far along in the process we are. By using red in this way, we’re clued in to the idea that red means progress – which leads me to the color codification part of this analysis. As I’ve outlined, the use of red in this infographic means progress – it shows us how far along in the process we are as our eyes move down the illustration. Not only does the designer utilize red in the “countdown timer,” but they also use it for text. Specifically, text that outlines progress: Each number (4 weeks, 6 weeks, etc.) that’s contained within a circle is red, making it glaringly clear how much time has passed since the start. The text that describes what step the bag is currently in is also in red (finding the perfect factory, designing, etc. ), along with how long that step will take (4 weeks, 2 weeks, etc.). What really ties this infographic together, making it both interesting and understandable, is the iconography. The icons are beautiful and simple, just like the overall infographic and the companies’ clothing. However, they’re also powerfully effective – they supplement the text perfectly, giving us a general idea of what stage the backpack is in before we dive into the text (or even without reading the text). Lastly, the infographic has a good basis of research. It’s coming straight from the company – straight from the source of the bags. All of the information has been gathered firsthand, and is completely reliable and accurate. It’s also curated well towards Everlane’s audience: the company is aware of exactly what their customers want to know, and is sure to clue them in to the pertinent information without oversharing, sharing too little, or sharing irrelevant information. “Production Timeline: The Everlane Backpack.” Everlane Unedited. Tumblr, 13 Apr. 2012. Web. 25 Jan. 2017. The below image is from a cookbook I bought a few years ago, titled Picture Cook: See. Make. Eat. by Katie Shelly. The book is a typical cookbook in that it’s made up of curated recipes, but it’s extremely atypical in that this is how all of the pages appear. While most cookbooks use large photographs and steps outlined in lists and paragraphs, Picture Cook strays far from this. It doesn’t rely on text instructions or photography, rather the recipes are laid out almost exclusively in illustrations. The use of text is extremely minimal, used only to label ingredients and utensils, or if an illustration needs a bit more explanation. Personally, I believe the infographic recipes within this cookbook are extremely refreshing and effective, and as an example for analysis I’ll focus on the recipe for sweet potato fries. I am a visual thinker, and for visual thinkers, this kind of infographic recipe is extremely refreshing. It’s simple and charming, boiling the recipe down to only what’s necessary. So, instead of reading through multiple steps and superfluous information, I can look at an illustration and know immediately what I have to do to make the dish. The arrows help guide me through the process, clueing me in to what I need to do first and how to progress from there to a finished product. The illustration style also lends a special physicality to the recipe instructions, which I find helpful – I can see hands mixing, salt shakers pouring, and a watch ticking. Instead of simply reading, “chop the potato this way,” I can see exactly how the potato should be cut, and see in the blink of an eye what comes next. It does a great job at getting the viewer involved with the subject. One critique I have of this infographic is its use of color. While I appreciate the monochromatic simplicity, I do think that using different colors for emphasis or highlighting important information would be helpful. If the words were a different color than the images, or if an extremely important step was illustrated in a brighter color, I think that would lend to the overall effectiveness of the infographic. Shelly, Katie. “Sweet Potato Fries.” Picture Cook: See. Make. Eat. New York: n.p., 2013. 53. Print. Schweppes Abbey Well is a spring water company, a sponsor of the London 2012 Olympic and Paralympic Games. I was originally drawn to this information graphic because of its iconography – my mind works in pictures, so when I see information laid out through icons and symbols rather than complex graphs, I’m immediately partial to it. Along with being visually interesting, I also think that icons and symbols were the appropriate choice for this infographic. All of the data they’re presenting is simple and numerical, requiring only one or two quantitative measures. For example, the statistic “2,000 newts were relocated from the Olympic Park to the Waterwoks nature reserve” wouldn’t make sense in any form of graph – it’s not comparing any two sets of data, nor is it a percentage of a whole, and it’s not a large amount of data that needs to be boiled down and represented in a typical data graphics format. They effectively presented the statistic with a large number and two illustrative newts, giving the viewers exactly the visual and informational cues needed for understanding. I was also drawn to this information graphic because of its unusual information. When one talks or thinks about data and statistics regarding the Olympics, it’s only normal to bring up comparative speeds between runners, how swimming times have decreased over the span of ten Olympic Games, or the distribution of scores among gymnasts. The data is very time and score oriented, which this information graphic strays from. Personally, I appreciate random facts, statistics, and data that isn’t necessarily important, but is certainly interesting and unbeknownst by most. Gaining insight into how many boxing gloves will be gone through over the course of the 2012 games, how many trees, plants, and bulbs have been planted in the Olympic village compared to the number of seats in its stadium, how much sunscreen will be gone through by Olympic Rowers, and how many trash bins will be emptied over the course of the Games is fun and interesting to me. However, as much as I like the Olympics, I don’t care a great deal about the typical time and score statistics like many who avidly watch might. Therefore, I think someone like me may be their target audience – someone who likes the Olympics enough to look at an information graphic about it, but who is likely more interested in fun, out-of-left-field statistics rather than actual sports data. The fun, bright and symbolic layout certainly speaks to that sort of person, however I believe they could’ve done a better job of narrative, hierarchy, and codification. Obviously, their color scheme is well thought out. It relates to both the colors of the Schweppes Abbey Well brand, and the colors of the British flag. The four color system is simple, impactful, and meaningful. However, their color codification needs work. There seems to be no real system in place for why certain colors are used where and when they are used. Some of the large numbers are red, some are white, some are light blue, and the same goes for the icons and body copy. It would be helpful for there to be some kind of color system to call out the information that is the most important, or at least help organize the information with our eyes and in our minds. Using certain colors for certain types of information would help with the visual hierarchy as well – the hierarchy is good as it stands, achieved by using bold text and larger point sizes for the important data, but a color codification system would improve it. The last assessment I have for this information graphic is its lack of direction or narrative. As I wrote previously, I certainly appreciate the “fun” and “random” facts that are shown. However, the information graphic may be slightly too random in its layout. Each statistic is compartmentalized, which is helpful, but my eyes still get a little lost. It would be effective to have arrows added, or some kind of pathway along which the data is placed, to help guide viewers through the data in a more narrative fashion. Emergency information found in the Seattle Pacific University Library. This example of an information graphic is one I pass nearly every day, yet I’ve never given thought to its design. It details extremely important information – what to do and where to go given the event of a fire, earthquake, crime, or medical emergency. Minimally, I think this information graphic does an good job. It has nice hierarchy and color codification: the important callouts (in case of fire, in case of earthquake, in case of medical emergency, and in case of fire) are in a bright an noticeable red, along with the evacuation location, the viewer’s place on the map, and the emergency number. The important icons denoting the fire alarm pull stations, elevator, and fire extinguisher locations are also in red. The “narrative,” if you could call it that, is good as well. The map is accurate, understandable, simple, and easy to move through, and the motions that need to be taken in case of an emergency are clearly outlined in step-by-step instructions. However, I think where this information graphic may go wrong is by not accounting for its audience. The sign is fairly small, therefore so is the text and the icons. And in the event of a fire, a medical emergency, an earthquake, or a crime, people are not going to take the time to read step-by-step, small-point-size instructions – that being said, I’m not even sure they’d stop to read a massive, flashing sign. Auditory instructions might be a better way to go, but that also takes time. This information graphic is probably doing all that it can to guide people in an emergency, and although the situation may not be ideal for deciphering a printed sign, it does its job relatively well. Citations: "Paralympics in Design: The 5 Best Infographics." Creative Bloq. Future Publishing Limited Quay House, 27 Aug. 2012. Web. 12 Jan 2017. For my informational interview, I met with Beth Galiardi, an administrative manager at Pacific Studio in Ballard. Pacific Studio is a nationally recognized exhibit design and fabrication studio, who “partners with designers, architects, museums, parks, visitor centers, universities, and sports venues to execute dimensional built environments that inspire interaction, elevate education, and shape curiosity and investigation in public spaces everywhere.” I was drawn to Pacific Studio because it seemed to have the full package – it’s not just about the visual design, rather it encompasses almost every part of exhibit and experience formation from start to finish. Their website boasts countless services: design, graphics, illustration, prototyping, building, hand painting, murals, conservation display cases, shop drawings, museum dioramas, artifact replicas and mounts, custom metal fabrication, water and light interactives, woodworking, sculpting, and mechanical/electromechanical interactives. What I also appreciated from my meeting with Beth is the importance that Pacific Studio (along with other exhibit design and fabrication studios) places on storytelling. Even if they’re creating something for a retail space or a sports venue – spaces that oftentimes get ignored, because those who walk through them (interactors, for lack of a better word) aren’t expecting or looking for experiences as they might be in a museum – they care deeply about creating an engaging and immersive story for the interactors. That story could be for the purpose of educating, furthering a brand or anywhere in between, but everything from the exhibit’s design to its installation is focused on the best way to tell that story. ART 4250: GOOD FLAG, BAD FLAG...AND LOGOS? 1) Keep it simple. The flag should be so simple that a child can draw it from memory. 2) Use meaningful symbolism. The flag’s images, colors, or patterns should relate to what it symbolizes. 3) Use 2-3 colors from the standard color set. 4) Don’t use lettering or seals. Never use writing of any kind. 5) Be distinctive (or be related). 1) A logo should be simple. Mars mentioned how a flag needs to work both on a large scale and a small scale due to both the different vantage points of viewers and the various uses of flag paraphernalia. The same can be said when it comes to logos – they need to work on both a large and miniscule scale due to their many uses (i.e. business cards, signs, banners, envelopes, and so on). Keeping a logo design simple lends itself nicely to said logo working well at all sizes, within reason. In terms of a child being able to draw it from memory – I think there might be a little wiggle room there. I like to think a logo could be at least a little more complicated than a flag (especially if it utilizes both typography and symbolism), thus if a child can’t draw it from memory I’m fairly certain that’s not necessarily the sign of a bad logo. 2) Logos should certainly use meaningful symbolism. Everything – the colors, the typeface (if type is utilized), the form, the placement of said type and form – should have a reason behind it. A logo is the identity from which all other brand elements stem, so if it doesn’t have a strong and meaningful connection to whatever is being branded, there’s a problem. 3) Although I’m not certain it’s a set-in-stone rule, I do believe that logos should use only 2-3 colors. Since a logo always needs to work in black, relying on too many colors in a logo could quickly make its use in black and white complicated or even render the logo unrecognizable. Using 2-3 colors is an easy way to make sure your logo remains simple, adaptable, and distinguishable. 4) This is where flag design and logo design differ. Logos can and do utilize text. However, this is where keeping it simple comes in once again. Your company logo doesn’t need to include the entire company philosophy underneath its name. Save the less-than-vital information for other branding materials. 5) Be distinctive (or be related) is another rule that fits with both flag and logo design. Since logos are what corporations, businesses, individuals, events, and the like use to identify themselves, they need be unique and able to set the company/business/individual/event/etc. apart from the others in their field. However, the logo also needs to ring a bell with viewers. It needs to be related to whatever it’s branding and oftentimes somewhat related to the logos of others in its field in order to be recognized for what it is. Roman Mars hit home the idea that flags are extremely important by using the example of the Chicago flag. The Chicago flag is absolutely everywhere – it’s adaptable and remix-able, used on anything from coffee cups to pins to t-shirts. it’s a distinct symbol of Chicago pride, deeply embedded in the civic imagery of the city. The flag is a banner under which people can rally to face important things. Mars even goes so far as to say, “It’s not just that people love Chicago and therefore love the flag, people love Chicago more because the flag is so cool.” And isn’t this exactly how we want people to feel about our logos? We want our logo to be so good, so “cool,” that it’s seen everywhere, used everywhere and plastered on everything. We want it to be simple, yet so impactful that it becomes more than just a logo. No matter what our logo represents, whether it be company or a conference, we want it to become a symbol under which people can rally. And these aforementioned rules can help us get there. In my work this week, creating thumbnail sketches for an exhibition design conference logo, I hope to keep these rules in mind. Carrying with me a newfound confidence that logo designs are extremely important, I will strive to combine simplicity, innovation, and symbolism to make a mark from which my conference brand can grow. In the article 13 Ways Designers Screw Up Client Presentations, author Mike Monteiro outlines the various mistakes designers often make when presenting their work to clients. Unfortunately, I found myself all too familiar with many of the thirteen presentation pitfalls. Most of Monteiro’s examples had to do with self-assuredness, which involves almost everything I struggle to be. Even if I’m internally confident in my work, I consistently come off to others as reserved, apologetic, and easily swayed. This article opened my eyes to the multiple ways in which I’m failing both myself and my clients. What I found myself most guilty of, ironically Monteiro’s number one mistake, was this: Seeing the client as someone you have to please. “The client didn’t hire you to make them happy or be their friend. Your decisions should revolve around adding your expertise to your client’s expertise to help them accomplish their goal. They will ask you to do things that run counter, in your expertise, to achieving the goal, and your job is to convince them otherwise. In the end, they will be better served if you see yourself as the expert they believe they hired. Doing the wrong thing to avoid an unpleasant conversation doesn’t do either of you any favors in the long run.” Oof – that’s me, right there, the avid people pleaser. I will do anything to make sure a client stays happy, including using three different display fonts in a logo. I knew it went against everything I’d ever learned about good design, however, just as Mike said, I did the wrong thing to avoid a potentially unpleasant conversation. After reading this article, I vowed then and there to never let my people pleasing nature get in the way of what I know to be right. Monteiro’s third presentation pitfall was one I notice all too often in myself and in other student designers: Starting out with an apology. In almost every classroom critique I’ve been a part of, either myself or one of my classmates will begin our presentation by apologizing – “I’m sorry I didn’t have enough time to finish,” “I’m sorry it’s terrible,” “I’m sorry ____.” The article made it crystal clear that at the time of presenting, there’s no time for sorry. Present what you have and get to the point. And on the topic of giving student presentations, whether they’re for a critique or a final, it should seem as though you’re presenting to a client – that client or clients being the intended audience or user of your creation. The eight mistake that designers often make when presenting to clients is also one I immediately knew I was guilty of: Getting defensive. “You are not your work and your work is not you. It is a product done to meet a client’s goals. The client is free to criticize that work and tell you whether he believes it has met those goals or not. You are free to disagree with him, and you are expected to be able to make a rational case for those disagreements. But you should not be getting emotionally hurt because of it, this is a job. There’s a difference between defending the work and getting defensive.” I have an extremely hard time separating my work from my worth as a human being, so critiques can (and have) gotten far too deep under my skin. I’ve always known it was a problem, but reading this section of the article reaffirmed that knowledge. I sincerely hope from this point forward to keep Monteiro’s words in mind when getting feedback on my work. Overall, I found this article extremely helpful. While most of the mistakes I understood and recognized, I also learned gained new insight into the world of professionally presenting. Presentation pitfalls such as “Giving a real estate tour (explaining what people can obviously see in front of them),” “Mentioning typefaces (Talking about design specifics that the clients won’t understand and don’t care about),” and asking questions such as “What do you think?” or “Do you like it?” had previously never crossed my mind. However, as Monteiro explained them, I realized that these mistakes truly can completely ruin both your presentation and the way your client respects you as an expert. The idea that clients need to consistently view you as an expert (because you are, and that’s why they hired you) was drilled into my head, as was the importance of confidence and business savvy leadership. Three things I’m currently not so good at, three things I now vow to work harder at. After a long and continually sidetracked session of browsing through the likes of Behance, Google, and Pinterest, I found myself drawn to the overall design of The 99U Conference 2016 in NYC. Because I had no prior knowledge of 99U or their conference (which, after a quick search, I found to be "Behance's effort to provide the missing curriculum for creating an incredible creative career...through [their] website, popular events [their annual 99U Conference brings together 950+ leading creatives for two days fully focused on the mechanics of making ideas happen. Through a series of intensive talks and master classes, the world's leading creative visionaries and researchers share best practices on idea execution], and bestselling books. "), it was inevitably the visual narrative alone that grabbed my attention. The conference brand was well executed, beautifully and minimally. The designers used only four colors throughout all of the materials (black, white, red, and teal). All materials included one, a handful, or all of the following shapes: squares, triangles, circles, zigzagged lines, and parallel diagonal lines. These two factors alone (color and shape) made the conference materials appear extremely cohesive. However, here's where I was left questioning: Upon first glance, all of 99U's conference materials employed a sans-serif typeface throughout. However, as I looked closer, I found that the phrase "The Conference - May 5/6 - New York City - Making Ideas Happen - Alice Tully Hall, Lincoln Center" (used on multiple materials), and the phrase "Creative Career Offsite - Friday, May 6th - 9:15 AM," (used on session tickets), were both printed in a serif typeface. These two phrases were the only visible usages of a serif typeface throughout the wide array of conference materials, and I couldn't help but wonder why that design decision was made. In my opinion, it took away from the cohesiveness of the conference brand. I was also left questioning the effectiveness of the repeated shapes - what was the meaning behind them? They looked trendy and cool, certainly, but was there a point beyond that? I couldn't seem to think of one. And because I knew nothing of 99U before laying eyes on their conference materials, I also knew nothing of their conference. As an uninformed party viewing their promotional materials objectively, I would have absolutely no idea what the conference was about - both their posters and promotional video, while visually beautiful and cohesive, give virtually no clues. A simple title of "The Conference" paired with seemingly random shapes just doesn't provide enough visual or readable information. Now, I'm assuming most if not all of the conference goers are aware of 99U and the purpose of the conference, so it's possible that my critique is irrelevant. However, if they were hoping for new followers, I deem their promotional materials somewhat ineffective. When it comes to the materials used at the conference itself, materials that will be seen by those who have signed up for the conference and are aware of what they signed up for, I believe those did a better job. They're minimalistic, yet provide all of the necessary information to guide you through the conference (such as large and small scale schedules, speaker biographies, session tickets, and name tags). Less necessary materials were also designed, showing that the conference brand designers put immense thought into the small details that rendered the conference into a cohesive and all-encompassing experience (such as stickers, a mini-guide to NYC, and a tote bag in which to place your conference goods). Overall, I think the conference brand designers did a good job of responding to the needs of their young, creative audience - the designs were fresh, clean, minimal, trendy, with avant-garde uses of shape and color. The designers put thought into making the materials unique and memorable, yet cohesive. Welcome to the blog portion of my little virtual land! Here I'll be posting thoughts + ideas + pictures related (sometimes) to art and design. Check back soon for further ramblings.